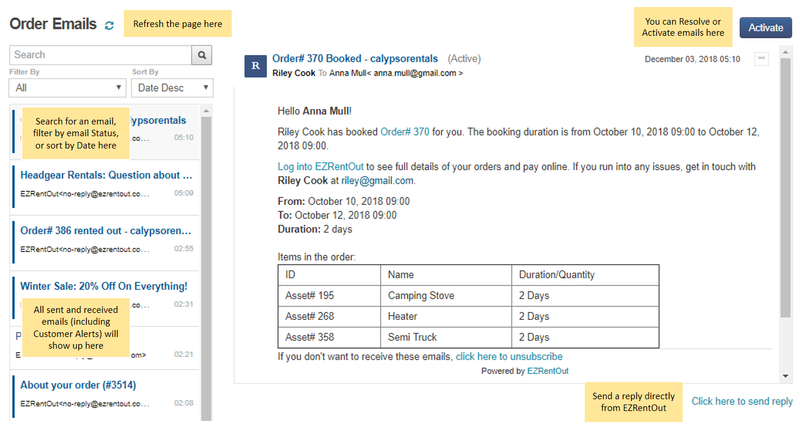 The Integrated Email feature enables you to manage all your Order Emails using EZRentOut. Order Emails are emails relating to individual Orders that are sent to and received from customers. The ability to manage these on EZRentOut means you can view customer queries, update Orders accordingly, and then respond to customers – right from the Order Detail Page. This streamlines the rental process and allows you to be a lot more responsive when it comes to your rental business. 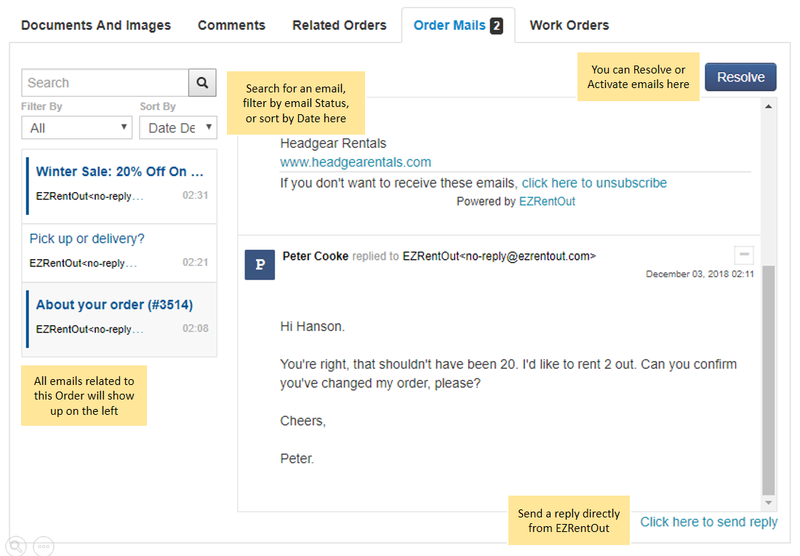 Order Emails don’t just refer to your personal communication with a customer, but also includes all the system-generated emails (called Alerts) that are sent to customers by EZRentOut. Of course, for this to work, the specific alert would have to be enabled under More → Alerts → Customer Alerts. 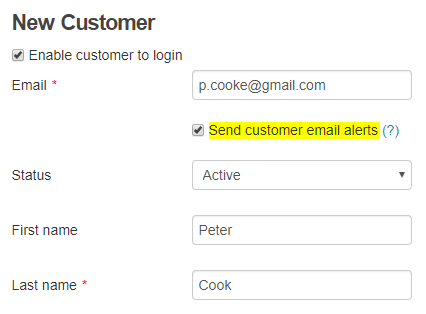 Read our blog to learn more about Customer Alerts. To begin using this feature, go to Settings → Add Ons → Integrated Email, and click Enabled. This is the name your emails will be sent out from. Note that the ‘From Email’ and ‘Reply To Email’ are set by default. This will open up an overlay where you can write up an email, attach an Order Printout, and send it on to your customer. You can read our blog to learn more about sending emails in EZRentOut. Click the ‘Send Email’ button when you’re done. Note: Users will not be able to CC individuals in their emails if they are on an EZRentOut trial. All messages such as this, customer responses to them, and Alert emails related to an Order will be collected within EZRentOut. There are two ways you can view this communication chain. Order Emails related to a specific Order will show up on a tab at the very bottom of that Order’s Detail page. The number next to the Order Mails tab shows the number of Active emails. A list of all incoming and outgoing emails is shown on the left. The title and content of an email can be searched using the search bar. You can sort your emails by Ascending and Descending Dates. Filters can be applied for Active and Resolved emails. You can set the status for an email by marking it as Active or Resolved by clicking the blue button at the top of an email (as shown in the image above). Replies can be sent to customers directly from here. You can expand or collapse an email using the + or – buttons next to the subject titles on the right. 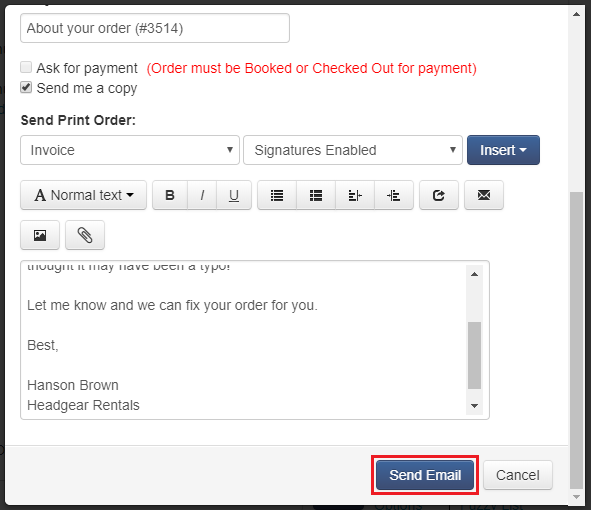 Currently, you can only send Order Printouts to customers when you first send them an email. However, you can still send any documents and images attached to an Order in your replies to them. If you must send an Order Printout at this stage, simply attach it under the ‘Documents and Images’ tab at the bottom of the Order Detail Page and attach it to a reply email. Note: If you want to view an email you just sent out, you must first refresh the Order Detail Page. This might take a few minutes to show up. This view is similar to the one found on an Order Detail Page, but includes all Order Emails sent to customers. Note: If you want to view an email you just sent out, you must first refresh this page. The refresh icon next to the ‘Order Emails’ heading lets you do this easily. Emails might take a few minutes to show up. Please note that the ‘From’ and ‘Reply To’ email addresses defined in the ‘System Generated Emails’ setting will not be applied for Orders when this Add On has been enabled. Instead, they will be replaced by system generated email addresses to track replies from customers. The EZRentOut team is working hard to add more functionality to this feature. If you have any questions or feedback, write to us at support@ezrentout.com!